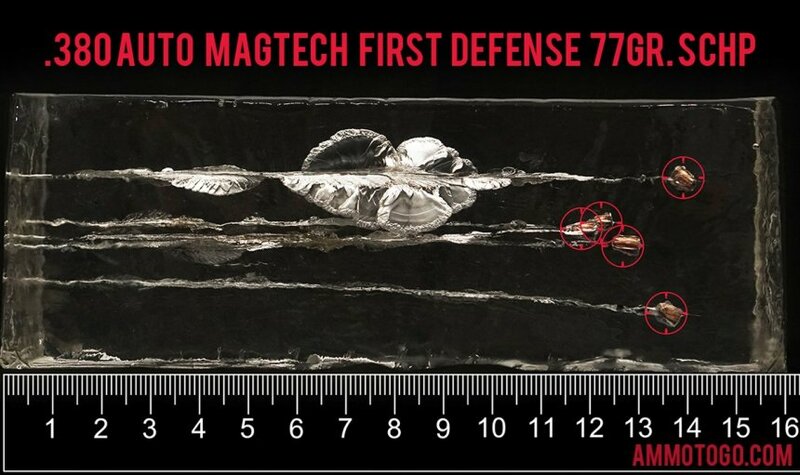 Magtech has been manufacturing quality ammunition since 1926. Commercially recognized internationally, Magtech exports products to more than 50 countries. Manufacturing all their own components, Magtech retains total control over every stage of the production process, ensuring consistency and quality with every round that leaves the factory. The company uses only the highest quality raw materials and state-of-the-art production techniques to produce some of the finest ammunition available to the modern shooter. 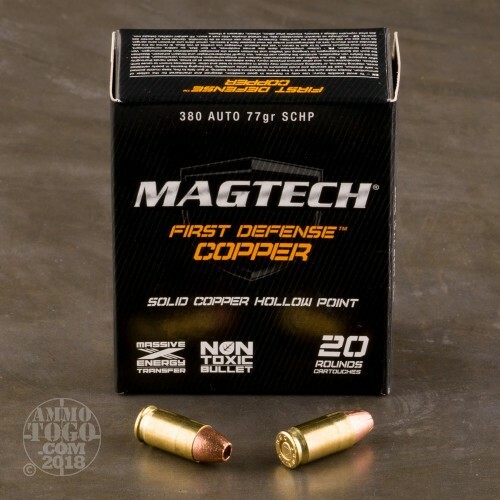 Magtech First Defense Copper features a lead-free solid copper hollow point projectile. Weighing in at 77 grains, the solid construction of these bullets eliminates the threat of core/jacket separation. The result is maximum energy transfer and 100 percent weight retention for hard-hitting terminal performance. Each box contains 20 rounds of factory fresh .380 Auto (ACP) ammunition. Leaving the muzzle at a velocity of 1099 feet per second, each round delivers 207 foot pounds of muzzle energy. 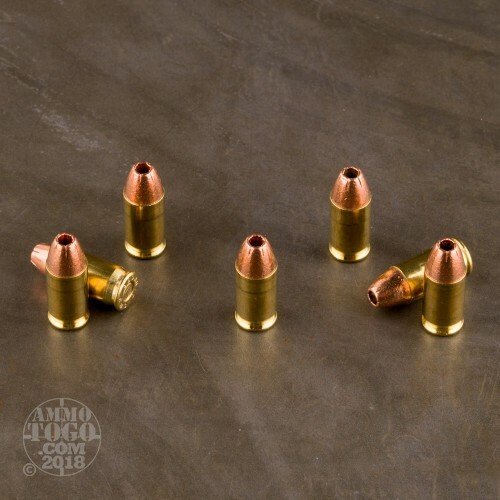 This ammunition is non-corrosive, boxer primed, reloadable, and brass cased. Like all Magtech products, First Defense Copper meets SAMMI and CIP specs. 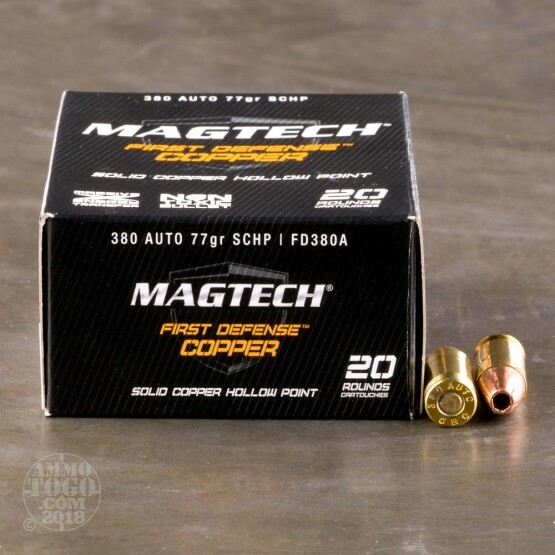 We fired five rounds of this Magtech 380 Auto (ACP) ammo through a cloth barrier into Clear Ballistics calibrated synthetic gelatin and recorded the results. For these tests, we used a Ruger LCPII with a 2.75-inch barrel. 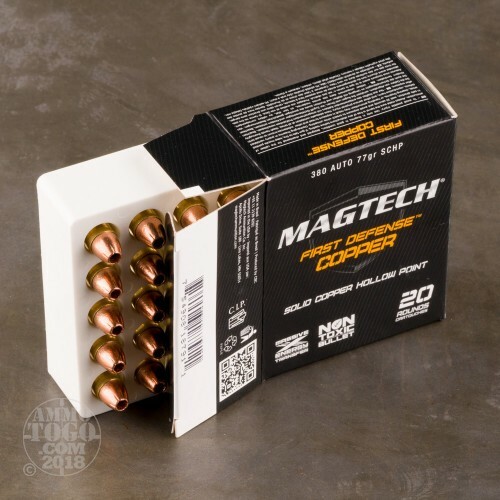 In the photos, graphics and video on this page, you can see specifically how the Magtech ammo performed and how it sticks up with the rest of the 380 Auto (ACP) ammo we have tested so far. How do the results for this Magtech 380 Auto (ACP) compare to other 380 AUTO? Penetration Depth Compared to 380 Auto (ACP) Tested 0" 10" 20" 30" MIN 6.5" MEDIAN 13.3" THIS AMMO 13.1" MAX 28.7"
This by far is some of the best 380 ammo I've purchased. It's accurate and dependable just what I need. I'll be back for more. This is some excellent self defense ammo and well worth the price. I will keep some on hand. This was a great price.